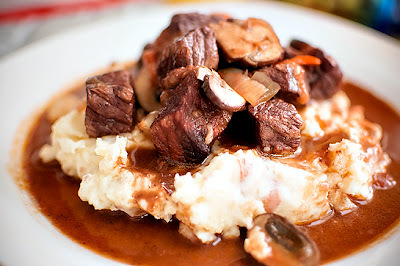 However you spell it or say it, Beef Bourguignonne (Bourguignon, Burgundy, etc. 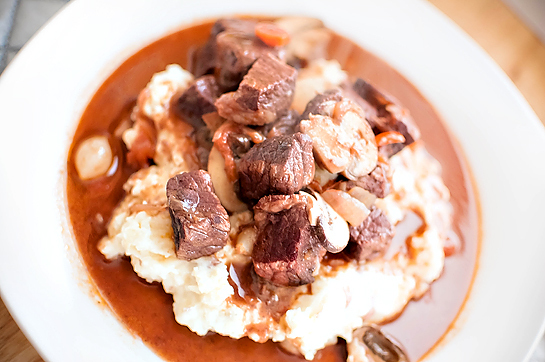 ), is a classic French dish made most famous by Julia Child. While we won't be making Julia Child's version here, it'll definitely be just as delicious! 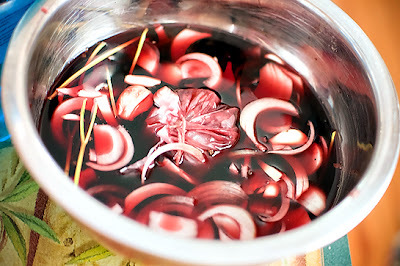 One thing that does differ here is that we'll marinate the meat for a couple hours before we start - this helps to infuse the deep flavor of the wine and aromatics, and in my opinion, makes this one of the best recipes for this dish! 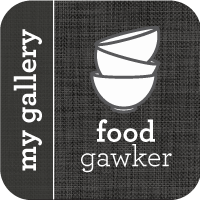 In a large bowl, combine the crushed garlic, onions, carrots, parsley stems, peppercorns, and wine. Place the leek, thyme, and bay leaf in a cheesecloth or coffee filter. Tie up tightly and place in mixture. Season with salt and pepper, to taste. Add the meat to the mixture and let marinate for about 2 hours in the refrigerator, uncovered. 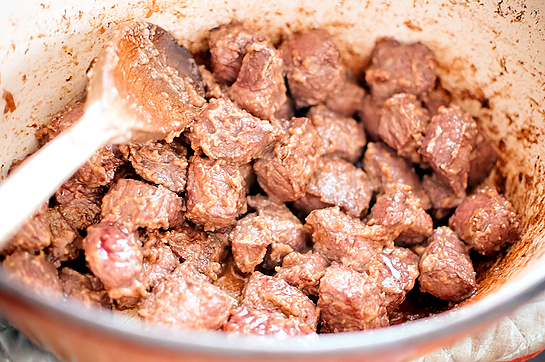 Remove the meat from the marinade and pay dry with paper towels. Reserve the marinade, don't get rid of it. Heat the olive oil in a large dutch oven, and working in batches, brown the meat until caramelized. 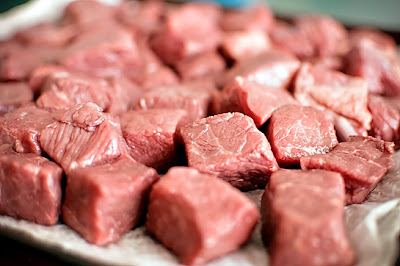 Set aside until all meat is browned. Return all meat to the dutch oven and sprinkle with the flour. Stir until a blonde roux is formed (about 3-4 minutes). 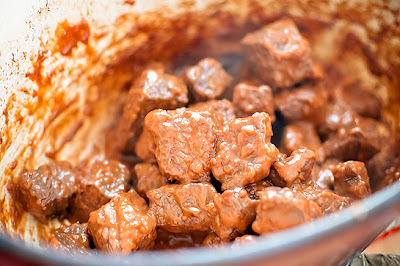 Stir in tomato paste and cook mixture for about 5 minutes. Add the reserved marinade, quartered tomatoes, and beef stock. Place dutch oven in the oven and cook until meat is tender, about 2 & 1/2 hours. Remove the meat from the sauce. Strain sauce though a china cap or mesh strainer, pressing down to get any excess liquid. 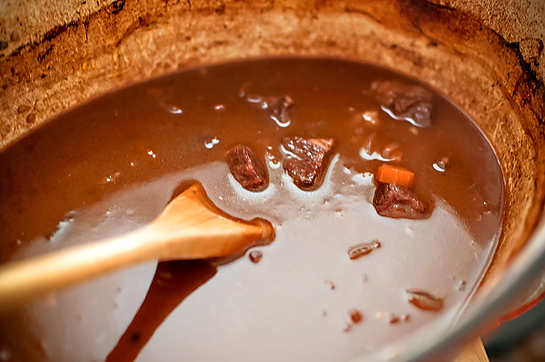 Discard solids and return liquid, as well as the meat, to the dutch oven. In a medium saute pan, melt the butter and saute the mushrooms briefly. Add to dutch oven. Add the pearl onions and season mixture with salt and pepper, to taste. Simmer mixture for about 10 minutes to blend all of the flavors together. Serve with mashed potatoes, egg noodles, rice, whatever you like! This is definitely comfort food at it's finest! Delicious. 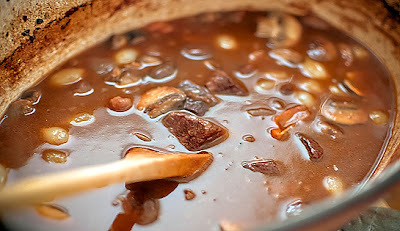 I love that you adapted beef bourguignonne in another way. 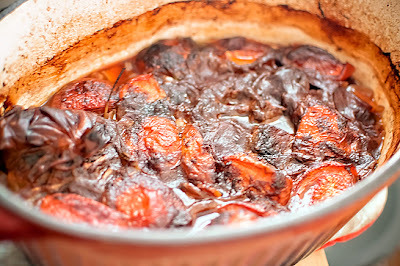 Oh I love boeuf bourgignon. One of my absolute favourite meals ever and yours looks great. Also...can't believe you've now moved from my bf likes it, to my fiance likes it and now...husband! Congratulations! this is one my favorite dishes! yours looks fabulous! This would be a hearty winter dish. I will have to remember to make this. Is there certain kind of red wine I should use? Any red wine will work - although the recipe is meant for a Burgundy (hence the name) - but I just used Trader Joe's Bull's Blood Hungarian Red and it turned out fantastic! 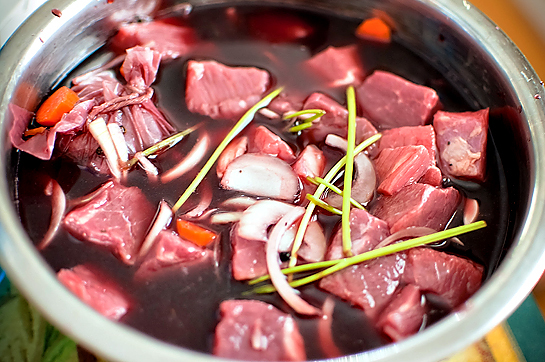 I love the idea of marinating the meat beforehand...next time I make this I'll try it that way! This is gorgeous. Looks so full of flavor. This looks like the perfect cold weather meal. Can't wait to try!